Aliisa Neige Barrière (b. 1995) was born into a French-Finnish family in Paris, where her music studies have included violin, piano, chamber music and choral as well as orchestral conducting. In the year 2011 - 2012 she studied violin with Renee Jolles in New York at the Preparatory Division of Mannes College of Music, as well as orchestral conducting and chamber music. As a winner of the Concerto Competition she played the first movement of the Khachaturian concerto in March 2012 at Symphony Space, New York. Apart from her studies at Mannes, she was a member of the Face The Music ensemble, directed by Jennifer Undercofler, dedicated to performing only music by living composers. In 2012, she continued her studies in Paris, in the ‘Cycle de Perfectionnement’ for young performers, playing violin and piano. 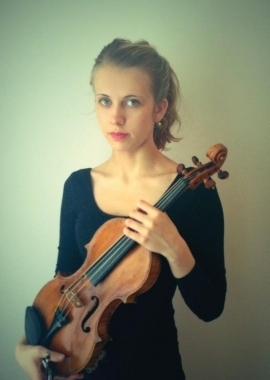 A passionate chamber musician, Aliisa has participated in a great variety of projects and masterclasses throughout Europe and the United States, and is interested in all music from baroque to contemporary. Her recent engagements have included solo appearances as well as conducting. Aliisa won the New School Competition in New York and was awarded a full scholarship for four years of studies at Mannes College of Music, where she has studied since September 2013 with Lewis Kaplan (violin), Michael Adelson (conducting), and Todd Philips (chamber music), and she is part of the Mannes Baroque Players under the direction of Nancy Wilson. She plays a 1717 violin by Claude Pierray.